Pianist/composer Emilio Teubal started playing the piano at the age of nine. He studied at Argentina’s National Conservatory and was an active performer in the tango and jazz scene of Buenos Aires until 1999, when he relocated to New York City to continue his musical studies. His latest album, Musica Para Un Dragon Dormido, was chosen as a 2013 best album and has been in the top 100 albums on E-Music. Joining Emilio are Ignacio Rivas Bixio on drums and Moto Fukushima on electric bass. Emilio received a BFA in music from the City College of New York, where he studied with prominent jazz figures such as Marc Copland, Scott Reeves, Bruce Barth, Mike Holober, John Patitucci, Cliff Korman and Ron Carter. 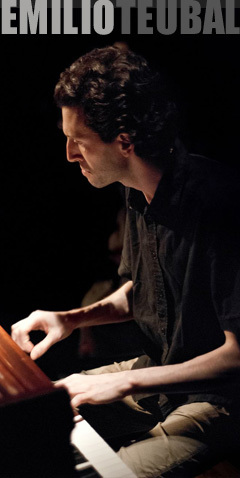 He received the Bushwick Composition Award for two consecutive years. Emilio has performed as a leader in some of the most prestigious venues in New York City, among them Iridium, Joe’s Pub, the Knitting Factory, BAM cafe , Cornelia Street Cafe, and the 55 Bar, as well as at major jazz festivals. In 2007, Emilio was awarded Meet The Composer’s prestigious Van Lier Fellowship, which provides support for talented, culturally diverse young people who are seriously dedicated to a career in the arts. His credits include performances and recordings with Grammy award winners Raul Jaurena and Fernando Otero, Erik Friedlander, Hector del Curto, Bob Mover, John Benitez, Lucia Pulido, Pedro Giraudo, Lisandro Adrover, Miguel Bertero, and Astor Piazolla’s legendary violinist Fernando Suarez Paz. Teubal has also been a steady member of several New York-based bands, including Sebastian Cruz’s Coba, Los Chantas Tango Group, and the Marta Gomez Group, with whom he has toured the U.S., Mexico, Spain, and Argentina. This Friday, April 25, 7-9 pm, join us for an exciting evening of music when Emilio and his Trio perform at the Ink Well Cafe, 408 Rogers Ave, between Lefferts and Sterling. This event is made possible with public funds from the Decentralization Program of the New York State Council on the Arts, administered by Brooklyn Arts Council (BAC).